What can the best camping chair offer you that other chairs can’t? Sure, you can fold it up and you can use it to enjoy the great outdoors without having to sit on the ground. But what else can it do for you? 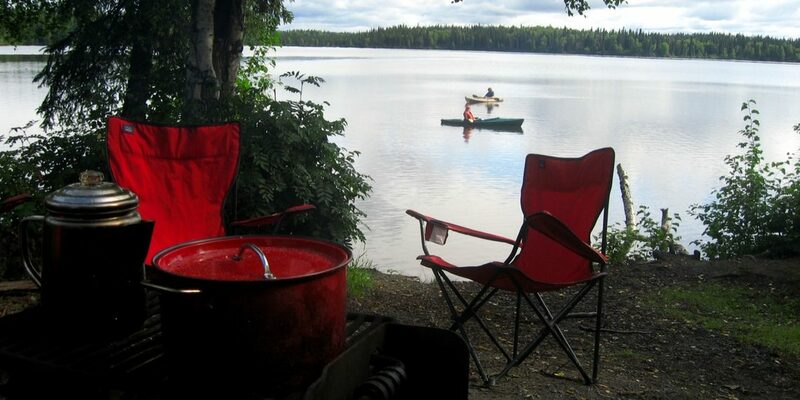 A good camping chair is durable and easy to carry. It can hold your beverages and various important knickknacks. You usually can’t have it all in one chair, so it’s up to you to decide which of these qualities is the most important to you. 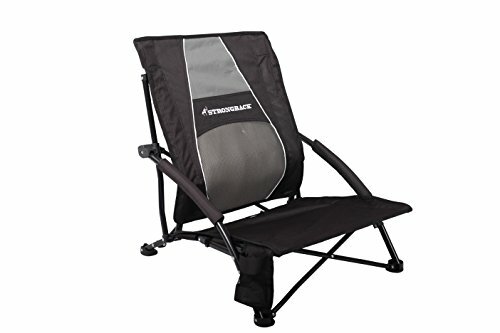 In our opinion however, the all-around best camping chair is the Strongback Camping Chair with Lumbar Support. This sucker is comfy, sets up in 2 seconds, and offers incredible support for the back (patent pending design). Not only does it provide comfort, it’s designed to be stable even on rough terrain. Where do you start looking? Here is a quick overview of the best camping chairs you can buy in 2018. This could be the best product for you if you want an extremely lightweight chair that offers sufficient back support. Its weight capacity is 300 lbs. Lightweight chairs are the best choice for backpacking or commuting. You can use them for outdoor events such as concerts too. But this chair doesn’t require a bag if you want to take it on hikes, as it comes with its own carrying case that folds up into a backpack with comfortable straps. Durability is an important consideration, and this steel-enforced chair is sure to last a long while without sagging. The material is guaranteed weather-resistant. You also get a cup holder on one side, as well as extremely cushioned armrests. This chair was designed to offer lumbar support that will leave you relaxed and fresh even after hours of sitting. In particular, this is a good choice for tall people. The frame is also designed to offer enough support for anyone with back pain. This is the best camping chair for backpacking because of the lightweight design. It’s particularly recommended for tall people looking for both back support and comfort. If you have back problems of any kind, it can be difficult to find a camping chair that will suit. After all, sitting in a soft chair will make you feel “stuck,” while hard surfaces place an unnecessary strain on your lower back. Plus, sagging means that even a well-designed chair can start causing problems the second time you use it. This product is a good solution for anyone who wants to explore the outdoors in spite of back pain. Not only is it fully padded, this chair comes with an adjustable back. You can tilt it back for a nap, and the structure is steady enough to keep you safe from toppling over. Since the seat is relatively firm, you can enjoy this chair even if you have bad knees and normally have trouble getting in and out of low chairs. What about portability? This chair may not be the best choice for long treks. Still, it comes with a spacious and high-quality carry bag with straps. The armrests are narrow and made of aluminum. However, there are side-pockets underneath the armrests, as well as a steady isolated cup holder. 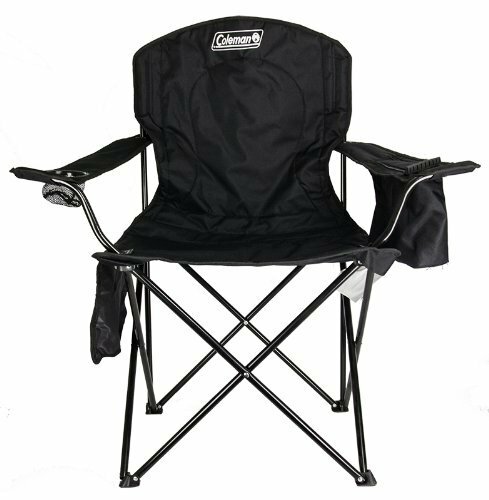 The firm structure and adjustable backrest are what make this the best camping chair for back problems. There’s no reason you should miss out on camping if you have a herniated disc or similar issues. Additionally, this chair is a good choice if you have to deal with knee or hip pain, because it is easy to get up from it. If interested, we actually put together a few additional recommendations specifically for folks looking for camping chairs for a bad back. In addition to providing good lumbar support, how can a camping chair be good for your posture? This beach chair will place you 4’’ above the ground. This can ease the pressure on your legs, especially if you’re on soft terrain. The backrest is extremely comfortable, and the armrests are low enough not to strain your shoulders and upper back. Every part of this chair is padded and durable, armrests included. The strong frame guarantees comfort and stability. Hence, this is another good choice for people with back issues. Since the feet of this chair are extra-large, you can be sure it won’t sink into the sand. You can take it on hikes as well. Just like STRONGBACK’s Elite Folding Chair, you can put the Low Gravity Beach Chair in a very durable, backpack-like carrying case. This chair has a weight capacity of 300 lbs. Because it’s made from sun-resistant material, it stays in good shape even after extended use. If you want a very well-balanced chair for a walk on the beach or a picnic, this one could be the best camping chair for you. Although the seat on this chair is low, you get good lumbar support and very comfortable armrests. This elegant chair was designed with tall people in mind. If you’ve been having difficulty with uncomfortably small camping chairs, this one is the right choice for you. The Folding Hillside Chair is designed to stay stable on slopes. There is a strap and buckle system you can use to adjust this chair on uneven terrain. You also have the option of buckling it up after you fold it, making it easier to carry. This chair is made from waterproof polyester, making it a great choice for waterside lounging. You can carry it with ease and pack it into a canoe. 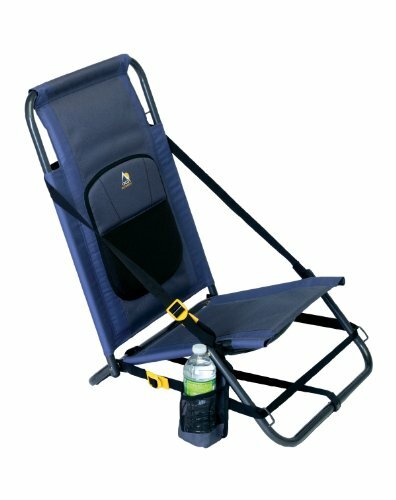 As this is an extremely lightweight camping chair, you can take it backpacking too. It comes with a drink holder or other neat pockets that will guarantee you’ll always have your stuff at hand as you lounge. You should go for this chair if you want the comfort of reclining at different angles, especially if most chairs are too low for you. It’s a great chair for a snooze! You can get camping chairs in various price ranges, and the quality varies wildly as well. But if you want to get the best camping chair for your money, you might want to go for the Coleman Oversized Quad Chair. 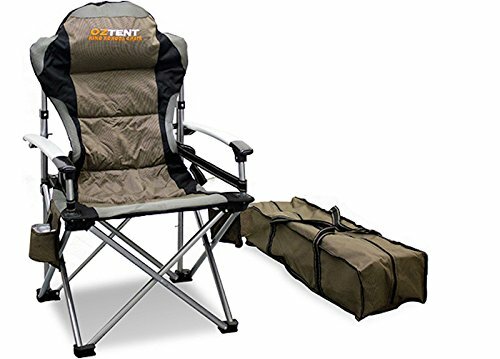 This camping chair is made from polyester and its weight capacity is 325 lbs. It is wide and designed for comfort above everything else. Although it isn’t a reclining chair, it’s great if you want to kick back and relax. The armrests are wide and comfortable. They come with a spacious pocket and cup holder. But what makes this chair stand out is the cooler built into the armrest. It can fit four cans and it’s great if you like having cold beer at hand, or fresh drinks for the kids. Although it may be too bulky for backpacking, this chair is fairly lightweight and easy to transport. It can handle different terrains, and you can clean it very easily. If you’ve been hunting for a plus-sized chair that can resist a bit of wear and tear, this may be the best camping chair for you. How are you planning to transport your chair? If you’re just looking for a lawn chair, any chair weight will do. When it comes to car transport, you can still go for heavier models. But what if you want to carry your chair with you wherever you go? Lightweight chairs are the best choice for photographers, artists, hikers and anyone who likes moving around to find the perfect fishing or hunting spot. This is particularly important if you have to lug around other equipment as well. In addition to the weight, make sure your chair isn’t too bulky if you want to transport it in a backpack. Camping can be stressful enough without chairs that need assembly before you use them. The best camping chairs are the ones you can set up immediately and also store safely in your garage. Models that come with buckles are a particularly good choice for this. While lower profile chairs are sturdier, they may be difficult to get out of. If you’re getting creaky at the knees, look for higher chairs and chairs that have a nice firm seat. Most chairs come with beverage holders, but the size and quality of the holders will vary. You may or may not want to go for a model that has pockets or a cooler (on that note, if you are looking specifically for chairs with coolers, we have a whole review on those here). Don’t forget that accessories can make your chair bulkier and more difficult to fold up neatly. Here are a few important questions people tend to ask before they go looking for the best camping chair. Can you use camping chairs at the beach? Absolutely! There are chairs designed specifically for use on the beach, but you don’t necessarily have to buy a specialized one. Look for low chairs with bulky legs that won’t sink into the sand. Since saltwater and UV exposure are both extremely damaging to fabric, the best camping chair for the beach should be very durable as well. We nonetheless recommend keeping your chair out of the direct sun. You can also look into accessories such as sunshades. How do you clean a camping chair? It’s generally safe to use mild soap on the material of your chair. You should take care to put them away clean and air them out on occasion. Mold and mildew are frequent problems, but you can use Lysol and other chemicals to remove them from the fabric of your chair. 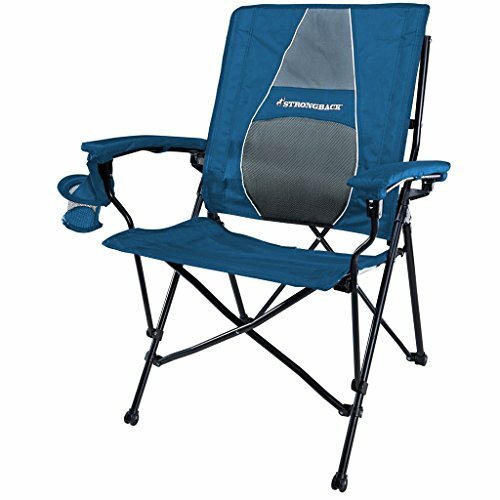 What are good camping chairs for outdoor concerts? Festivals and concerts are a great occasion for buying a camping chair. However, if you’re expecting to have a wild time, a less expensive chair will do. After all, there’s a high chance of it getting broken or misplaced in the crowd. Since you don’t want to block anyone’s view, the best camping chair for festivals is low-backed. It’s also mud and water-resistant. You know how it goes – the more you’re looking forward to an event, the worse the weather is going to be. But your most important consideration is weight. You don’t want to get stuck with a heavy chair, especially if you expect to move around a few times during the concert. Finally, having a beverage holder at a concert is just good sense. You may need to do a bit of clicking around before you get to the camping chair of your dreams. But when you find the right one, it’s going to become an essential part of your vacations.